J. Mitchell McGrath may not seem the man to be cast in the role of a revolutionary. But he is part of a new guard of younger geneticists at ARS who are leading a genetic revolution in the sugar beet breeding industry. It began 10 years ago, according to Thomas K. Schwartz, executive vice president of the Beet Sugar Development Foundation of Denver, Colorado. Schwartz says that this new guard brings the tools of molecular biology to sugar beet breeding for the first time—without necessarily using genetic engineering—allowing a look at how a sugar beet grows, down to the level of gene molecules. 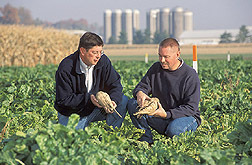 He cites McGrath, in ARS's Sugar Beet and Bean Research Unit at East Lansing, Michigan; Leonard W. Panella at Fort Collins, Colorado; and John Weiland at Fargo, North Dakota, as examples of scientists ushering in an era of faster, gene-based sugar beet breeding. Under a MOU (memorandum of understanding) with USDA, first signed in the 1940s, the foundation provides germplasm, research assistance, and funding for these and a handful of other ARS geneticists from Maryland to California who are mapping the sugar beet genome. The group is one of just a few in the world working on the sugar beet genome and the only public breeding group in the United States doing so. ARS shares all its data publicly. Though half of America's sweet tooth cravings—and a third of the world's—are satisfied by beet sugar, Schwartz says the industry is still considered a small one—a minor specialty crop. There are only five small sugar beet breeding companies in the world, all overseas, and the foundation represents all but one of them. The foundation acts as a research arm and umbrella organization for its member companies. The MOU that's evolved over the years charges ARS with developing basic germplasm lines and releasing them to the foundation, which distributes them to members. "Our companies are best suited for commercial development," Schwartz says. "They're not suited for the type of genetic program McGrath and his colleagues around the country are working on. That's very specific, and expensive, research." It recently yielded about 20,000 sugar beet gene indicator tags—ESTs (expressed sequence tags)—which represent some, but not all, of the 30,000 genes thought to make up the functional part of the genome. The latest project funded under the MOU calls for screening the sugar beet genome with another new tool, a BAC (bacterial artificial chromosome) library. McGrath explains that a BAC library uses safe strains of Escherichia coli bacteria to store sugar beet DNA. These sequences are then either screened with genetic markers or compared with sequences of known genes to connect them with possible traits. The same thing is done with ESTs. McGrath began with sugar beet DNA he prepared with Weiland and worked with a contract firm to prepare and package the library. Each clone in the library of 38,400 cloned bacteria stores a different DNA sequence from the beet's genome. "We chop up sugar beet DNA and connect segments to bacterial plasmids that carry the DNA into E. coli bacteria," McGrath says. Schwartz explains that member seed companies can then either buy cloned copies of the living bacterial library or DNA samples on filters, as two have already done, or they can rely on McGrath or the contract firm to compare their germplasm's DNA sequences with those in the library to identify traits—or at least chromosome location—associated with each DNA sequence. "This is an important first step to create order in these early days of sugar beet genome mapping," says McGrath. "We don't have a common language for any of the beet's nine chromosomes." Schwartz says that seedling emergence is one of the most important traits to sugar beet growers everywhere. At an industry meeting in 1996, Schwartz saw McGrath bombarded with requests for help on emergence. As one grower put it, "If we don't get it out of the ground, it's no good to us." 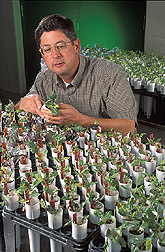 "McGrath put his nose to the grindstone," Schwartz says, "and quickly came back with a simple test for the emergence trait, which he gave to the foundation, and two possible genetic markers for seedling emergence and vigor. His test for emergence has already led to commercial varieties with higher germination rates." He developed it by growing seeds in pure water—comparable to the multiple stresses seeds encounter in the field. His possible genetic markers promise to help identify and locate the emergence genes on the chromosomes, one of the goals of the genome project. Paul Pfenninger, vice president of agriculture for the Monitor Sugar Company in Bay City, Michigan, agrees that farmers' greatest concerns are that the seed sprout and that the seedling survive its first month—what's called "seedling vigor." (K11119-1) "One unique thing about sugar beets is that only about half of the seeds actually sprout," says Pfenninger. "Those tiny seedlings are exposed to everything from soil crusting to insects to disease to strong winds. A 40-mile-per-hour wind in that first month or so could wipe out a third of your seedlings. They're too delicate to withstand the sandblasting caused by strong winds carrying dirt particles." But disease remains the main threat. Farmers rotate their beets with other crops—mainly corn, soybeans, and wheat—to avoid the disease buildup that can occur from growing beets in the same field 2 years in a row. 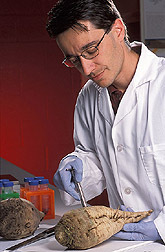 McGrath's team consists of two technicians and three graduate students. One student developed a test for Aphanomyces seedling disease and used it to show there are two genes needed for resistance. Another student is examining sugar beet germplasm to develop ideas that could help in breeding for resistance to Rhizoctonia seedling disease. The third has found that sugar beets radically alter expression of a host of genes at about the same time that Rhizoctonia resistance begins in fields. (K11110-1) How Sweet Can It Be? Pfenninger says that after emergence and survival, the main concerns are yield and sugar levels. McGrath has found a possible marker to predict beets with high sugar content when they're about 7 weeks old, instead of waiting for full growth in about 25 weeks. He and colleagues theorize that beets with the highest sugar content aren't better at storing sugar; they are just better at keeping the sugar concentration high because they let less water in. 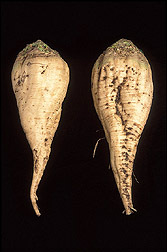 McGrath and others had observed that beets with the most sugar tended to be smaller and less watery. 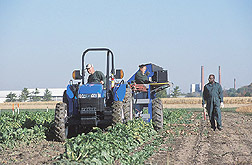 Having worked for Monitor since 1978, Pfenninger understands the value of having people like McGrath's team on his side—scientists on the cutting edge of technology but still accessible and connected to the real world of sugar beet growing, processing, and marketing. Pfenninger has watched almost every other private beet sugar processing company collapse, sold to farmers who organized co-ops to save their local markets. A recent string of 30-year-low prices sped up the process. How Smooth—and Healthy—Can It Be? Another major industry concern is the tendency of mud and soil to stick to sugar beets at harvest, embedded in natural ridges. While processing shakes loose as much dirt as possible before weighing, growers must truck it back to their farms. This not only burns diesel fuel, but can also spread disease as soil is moved from field to field. Dirt removed later in processing costs the industry a lot of money. Monitor spends from one-half to three-quarters of a million dollars each year disposing of the soil in special storage ponds and dredging the ponds when they become too full. 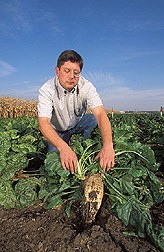 Monitor worked with McGrath's team to develop new sugar beet germplasm with smooth roots that will cut soil loss—and disposal costs—by about half. They're now incorporating resistance to Rhizoctonia and other diseases into this new germplasm. Working with Bob Lewellen, an ARS geneticist in Salinas, California, they've already released sugar beet lines that combine smooth roots with high sugar content and resistance to rhizomania, a disease that appeared in Michigan for the first time last year. That germplasm—done without molecular genetic tools—is symbolic of future releases envisioned: custom-designed sugar beets with more of what industry wants built into them. They will be assembled by a new kind of breeder pulling genes for desired traits off the "library shelf" one gene at a time and combining the genes, using traditional plant breeding, into new lines. Those lines will be the eventual payoff of the genetic revolution. In the meantime, McGrath and colleagues will continue to release ever better germplasm—and better tools for breeders.—By Don Comis, Agricultural Research Service Information Staff. 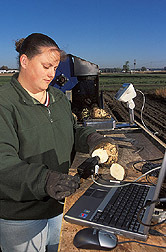 J. Mitchell McGrath is in the USDA-ARS Sugar Beet and Bean Research Unit, 494 PSSB, Michigan State University, East Lansing, MI 48824-1325; phone (517) 353-9262, fax (517) 337-6782. "New Breed of Beet Geneticists Shows How Sweet It Can Be" was published in the April 2004 issue of Agricultural Research magazine.